The National goes green: Heather Ackroyd and Dan Harvey are covering the Fly Tower with grass. They spoke to Robert Butler for the National's own theatre programme. You might expect the first line of a play to have an impact on a theatre audience. You might not expect it to have an impact on the building itself. But anyone who sees the National’s Lyttelton fly tower covered in grass this summer (and wonders why) should turn to the work of the Swedish playwright August Strindberg. Two years ago the National Theatre presented Caryl Churchill’s version of Strindberg’s A Dream Play. This surrealist drama, written in 1901, opens with the line, ‘Look how the tower has grown’. Before rehearsals, the director Katie Mitchell rang two artists she knew and left a message. Heather Ackroyd and Dan Harvey are best known for their pioneering use of grass. In 2003 they grew the inside of Dilston Grove, a deconsecrated concrete church in Bermondsey. Katie Mitchell’s message on their answerphone suggested that their next project might be the Lyttelton fly tower. By chance, this was an idea that had occurred to the artists themselves. 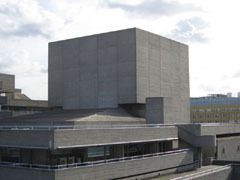 When Ackroyd and Harvey started working together in 1990, they used to pass the National Theatre (crossing Waterloo Bridge on the bus home to Brixton) and ‘wondered idly’ about covering the fly tower. They dismissed the idea because they had never worked on that scale. Seventeen years later, this is exactly what they are going to do. It will be their biggest project to date. Read article in full here. Over the weeks, the FlyTower grass will gradually yellow and fade. In an interview with Alastair Sooke in the Daily Telegraph, Ackroyd discusses the idea of senescence in their work. "It's never easy to see a piece degrade. It's always slightly disturbing." As it changes, though, it will take on a new resonance: "in an age of drowning polar bears and carbon footprints," writes Sooke, "it will be hard not to think about global warming". "Climate change is this epic drama that's unfolding before our eyes," Ackroyd says. "Yet you still see people who've got their heads in the ever-warming sand." "By day two on the fly tower," Ackroyd says, "I know I'm going to be as riddled with nerves as if I was stepping out on the Lyttelton main stage to perform a soliloquy to a packed house. If we can pull it off, though, it will be great."